Press Association/AP/Amr Nabil. All rights reserved.Several articles in the Italian press – by journalists and others with no experience or knowledge of research in the Middle East – have suggested that Giulio Regeni’s supervisors bear responsibility for sending him into a dangerous situation, alleging that they knew that it would put his life at risk. These are preposterous claims and those who make them are both irresponsible and despicable. They are irresponsible because one does not make such a serious accusation – of having deliberately sent someone to death – without having full knowledge of the situation and holding irrefutable proofs. And even if you believe that you hold such proofs – if you are not part of a lynch mob, but a person who respects the basic tenet of justice under the rule of law according to which everyone is innocent until proven guilty – you raise questions instead of making straightforward accusations, as long as guilt has not been officially established. The accusers are despicable as well because they lack a sense of human empathy. They don’t take into account the feelings of supervisors confronted with the massive tragedy of the loss of their student, a person whom they have known well and with whom they have had long hours of exchanges over several years. Instead, they accuse the supervisors of bearing responsibility for the murder. In doing so, they act like journalists who publicly accuse parents of being responsible for the death of their child when they have no real clue about it and no guilt has been established in any way. 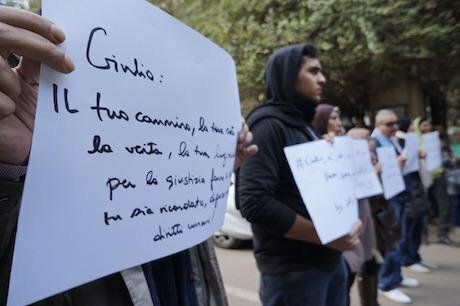 In the specific case of Giulio Regeni, the accusatory behaviour is all the more irresponsible and despicable since it is based on a total ignorance of research conditions in Egypt and Giulio Regeni’s research in particular. I happen to have known Giulio personally: after finishing his master’s degree at Cambridge, he contacted me in 2012 to prepare his PhD under my supervision. We exchanged emails and had talks about his research proposal. Giulio wanted to study the new independent labour movement in Egypt. I found this to be a perfectly reasonable project on which he already had good knowledge. He submitted a PhD application to my university requesting me as supervisor, and I accepted it. That was in early 2013. In June of that same year, Giulio wrote me that he had not been able to secure funding for his PhD studies, and had to give them up temporarily. He was writing from Cairo, where he worked with the Ministry of Industry together with UNIDO, the United Nations Industrial Development Organization. Giulio was not “sent” to Egypt into an unknown land to do research assigned to him by some supervisor, as so many cheap journalistic comments claimed, but was determined to conduct research on a topic on which he had already accumulated findings, in a country with which he was quite familiar, and where he had lived for some time before he finally registered for a PhD in 2014, back at Cambridge, his alma mater. I personally know several other students in various universities who have worked or are presently working on PhD theses on the topic of the Egyptian labour movement. That is to say that there was absolutely nothing extraordinary in Giulo Regeni’s research. It was not like, for example, wanting to undertake research on ISIS in ISIS-controlled territory! Add to this that supervisors’ relationships with PhD students are those of academic advisors to adult researchers, not those of school teachers to teenagers who need authorisation from their parents in order to take part in a school trip. Supervisors moreover do not control their students’ movements by locating them permanently through their smartphones! So whatever the circumstances under which Giulio was assassinated, it is completely outrageous to blame his supervisors for his murder. This article was first published in Italian on ilsole24ore.com.